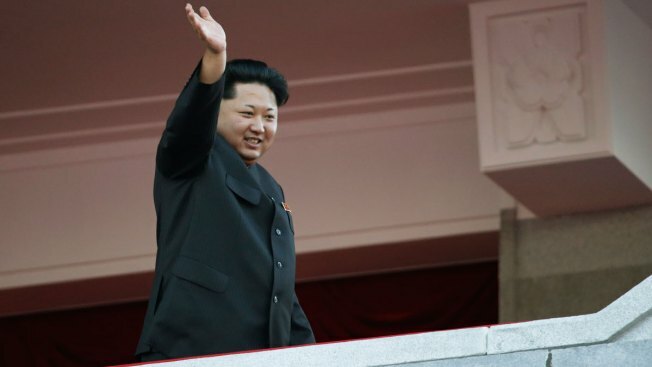 North Korean leader Kim Jong Un waves at a parade in Pyongyang, North Korea, Saturday, Oct. 10. Seoul's spy agency on Tuesday accused North Korea of having hacked into the smartphones of dozens of key South Korean officials, stealing text and voice messages and their phone call logs. The announcement came a day after North Korea warned of pre-emptive nuclear strikes in response to the start of Seoul-Washington military drills it views as an invasion rehearsal. This year's drills are the largest ever, meant to respond to the North's recent nuclear test and long-range rocket launch. The National Intelligence Service said in a statement that the cyberattacks were made between late February and early March. It didn't say which officials' phones were hacked or whether the stolen text and voice messages contained any sensitive information. The statement said North Korea also unsuccessfully tried to hack into email accounts of South Korean railway officials earlier this year in a preparation for cyberattack on the South's railway transport control system. There was no immediate reaction from North Korea. Seoul has accused Pyongyang of launching a slew of cyberattacks in recent years. Pyongyang has denied the claims. Many alleged North Korean cyberattacks failed to infiltrate computer systems of businesses and government agencies. But in several successful cases, also denied by North Korea, hackers destroyed hard drive disks, paralyzed banking systems or disrupted access to websites. One of these attacks was so crippling that a South Korean bank was unable to resume online banking services for more than two weeks. In 2014, the United States accused North Korea of a cyberattack on Sony Pictures over a movie depicting the fictional assassination of the North's leader, Kim Jong Un. North Korea has denied any involvement in the hacking. Last year, South Korea said North Korea has a 6,000-member cyber army dedicated to disrupting the South's military and government. The figure was a sharp increase from a 2013 South Korean estimate of 3,000 such specialists.